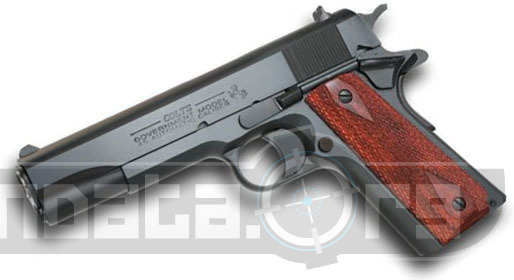 The Colt O1991 .45 ACP has a magazine of 7, and has a carbon steel receiver. The receiver finish is blued, slide and slide finish are also carbon steel and blued. The 45 ACP has high profile sights making it easier to see, this model like the O1091 has a Hammer Spur for a bit more aggressive look and feel. It has a nice rosewood stock that has been scored. This gun is single action only and has an overall length of 8.5 in and weights in at 35 oz.